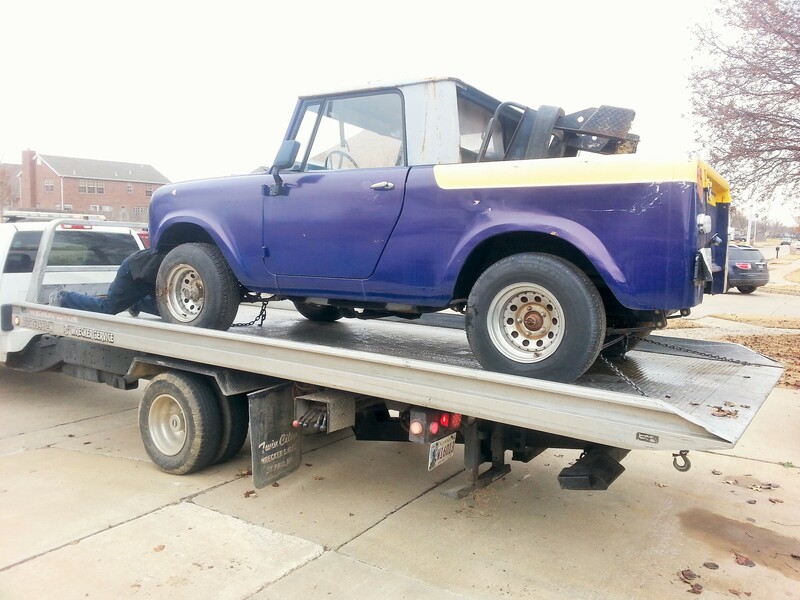 So, I bought this 1963 International Scout about 10 years ago. For those of you who don’t know what that is, think old Bronco. I put a lot of work into it and had dreams of taking Rebekah for a ride, and someday, my kids. But between living on a teacher’s salary and getting married, I found less and less time to work on it, and honestly, I was losing the desire to finish it. My new passion: the Honda Ruckus! Yes, I now want to be a nerdy scooter guy with a scooter gang. Yes, I said scooter gang. So surely I can find someone with a Honda Ruckus who wants to trade for a 50 year old truck that doesn’t run with no title, right? Well, after listing it a few times unsuccessfully, I got the title sorted out and I started to think that the trade wasn’t going to happen. This kind of bothered me because I had to have a trade if I wanted a Ruckus. I mean, with all the money we need I just couldn’t justify selling it and then buying what was really just a toy. If I sold it, the money had to go to the adoption. But I reeeeeeaaaaalllllly want a Ruckus. But I got to this place where I realized that, like so many other things in life, it’s not about what I want. It’s not about how I can spin the whole thing to make getting what I want feel okay. It’s really all about what will help accomplish the mission that God has entrusted to me. That mission is to give some kids a good home. So I listed it again for trade or cash. I decided that whatever came to me was what God had for me. I couple of days later, I got a call from a guy who wanted to buy it. I wasn’t holding my breath. It was, after all, a Craigslist deal, and those usually are no-shows. But this kid wasn’t. He and his brother came to look at it. They were serious about buying it and wanted to give it to their mother for Christmas. She had been talking for years about how she wanted one just like this and they wanted to surprise her. I was asking $2000 and they offered $1800. How could I say no. SOLD AMERICAN! The next day they showed up with cash and as I watched my friend of 10 years roll out of the drive on a tow truck, I was filled with lots of emotions. There was a little sadness, a feeling of humbleness that I was open to God’s will above my own desires. Overall I was grateful that God had brought such a great amount of money for the Scout (about $1000 more than I paid for it) and that, while I wouldn’t be able to give my kids a ride, the Scout helped bring them home. Hopefully, there is a lady in Mounds, Oklahoma who will derive a great amount of joy from taking that thing for a spin. Who knows? Maybe someday I can take the kids around the block on a scooter.